Are you concerned that you aren't saving enough for retirement? Well, you're not alone. In fact, more than one third of Americans haven't started investing for retirement yet. About 75% of Americans over the age of 40 are also behind on their retirement savings, so it's time to break the statistic. We've come up with some common warning signs that you may not be saving enough and need to increase what you're investing. First, you need to figure out what the minimum is that you'll need to retire. This will allow you to properly plan your retirement and ensure you are meeting your benchmark goals. Work on determining a target retirement age and goal amount so that you can develop a savings plan on your own or with a skilled professional. It's also important that you know what you'll get from Social Security so that you can plan what you need to save above that. Lastly, work on an estimated monthly financial plan so that you have some idea what you'll be spending on monthly bills and debt payments. 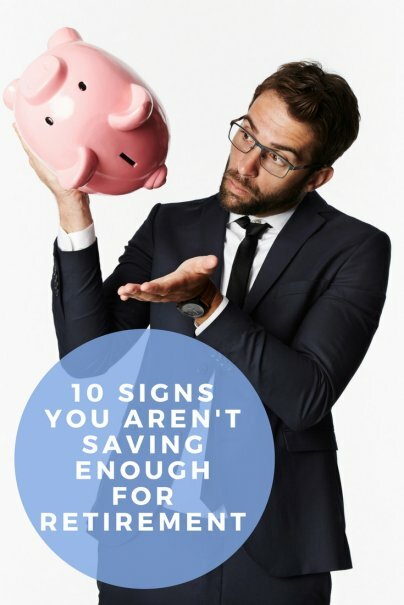 Most professionals recommend saving at least 10% of your gross salary, if you've been saving since your 20s. However, if you don't start saving until your 30s, Schwab recommends upping that contribution to 15%–25%. If you start in your 40s or later, you would want to save 35% of your income, which is a rather hefty amount. This is all thanks to the power of compounding interest, so it's never too early to start saving. If your employer is matching your 401K contribution, that is basically free money invested in your future. That's why it's crucial to at least match your employer's contribution, so that they can help you prepare for your retirement as much as possible. Borrowing against your 401K is never a good idea. It may help in the short-run, but in the long-run, it can affect your savings goals and financial health during retirement. You would also need to save more aggressively going forward just to catch up with your original savings goals. One of the first things you should always think about is building savings for yourself so you have the money you need in case of an emergency or unexpected expense. Short of that savings account, you shouldn't be prioritizing anything over your retirement savings. Your retirement and your future should be your first priority, even over your children's education, because nobody will be saving for your retirement except for you. On average, inflation rates linger around 3%, which means that your expenses will double in less than 25 years. You will need to account for this, as it's one of the biggest retirement planning mistakes anyone makes. Possibly the most obvious sign that you aren't saving enough is that you feel very nervous about retirement. If you don't think you're saving enough, then you probably aren't. Do you know of other signs that a person isn't saving enough for retirement? Please share your thoughts in the comments! The key is to start saving/investing early in life and be consistent (save with every paycheck). Taking advantage of a matching 401k plan should be a no brainer. The power of compounding is lost on many people. Also maxing out contributions when possible, eliminating debt, avoiding risks with your nest egg, planning for multiple streams of income once retired (social security, pensions, dividends, part time work, etc.) and making catch up contributions once you reach 50 should all be part of everyone's plan. And work at staying healthy to reduce illness, injuries and medical costs. I recently found the site Retirement And Good Living which provides information on all these issues as well as many other retirement topics and also has several retirement and health calculators. Get a CPA for advice and NOT a salesman !! !